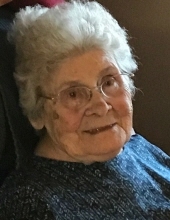 Age 99 of Chesaning passed away on Monday, October 15, 2018 at Shiawassee County Medical Care Facility. A Mass of Christian Burial will be held at 11:00am on Friday, October 19, 2018 at St. Peter Catholic Church with Father Bill Gruden officiating. Burial will follow at Resurrection Cemetery. The family will receive friends at Nelson-House Funeral Homes Martin Chapel on Thursday, October 18 from 2:00 to 8:00pm with a Rosary prayed at 7:00pm. Barbara was born on March 28, 1919 to John and Barbara (Scherer) Hedrich Sr. in Detroit. She married Paul M. Beckman on February 22, 1941; they celebrated 61 years of marriage before he predeceased her in 2002. Barbara spent her life as a loving homemaker, raising her four children. She loved nature and animals; she always enjoyed watching and feeding birds. Barbara was an artist, and she also enjoyed baking and sewing. Above all, she loved caring for and spending time with her family. She was a member of St. Peter Catholic Church. Barbara is survived by her children, Robert (Lenore) Beckman and Barbara (Chris) Wenzlick; her daughters-in-law, Julie Beckman and Karen Birchmeier; her 15 grandchildren, 16 great-grandchildren, and 7 great-great-grandchildren; her brother, Adam Hedrich; and many nieces, nephews, and special friends. She is predeceased by her husband, Paul; her sons, Gerald Beckman and Edward Beckman; her granddaughter, Mary Beckman; her parents; and her brothers, John, Matthew, Wendall, Joseph, and Thomas Hedrich. To send flowers or a remembrance gift to the family of Barbara Beckman, please visit our Tribute Store. "Email Address" would like to share the life celebration of Barbara Beckman. Click on the "link" to go to share a favorite memory or leave a condolence message for the family.